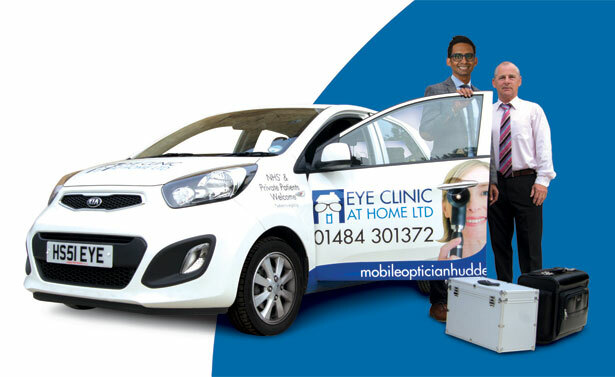 Eye Clinic at Home Ltd is a family-run independent business, set up by optometrist Harjinder(Harj) Sunda in 2007 and operating across West Yorkshire. Having qualified in 2003 from Anglia Ruskin University in Cambridgeshire, Harj spent his pre-registration training year at Boots Opticians in Northhampton, where he gained practical experience working with people of all ages and backgrounds. He went on to work for a national domiciliary optician, whereby his time was split between home visits and clinic. It was during this time of working with people in their own homes – people who may not have been seen by healthcare professionals in years, that Harj felt he was making a real difference to peoples lives. Taking this experience and identifying how things could be improved further, Harj established Eye Clinic at Home Ltd to treat people who were otherwise unable to leave their homes. As a home visiting optician, whose main amount of business came from falls nurses, district nurses and physiotherapists referrals, the business also started to attract people who were mobile but who simply did not have the time to go to a high street optician. From carrying out eye tests at home, the business has gradually grown to offering eye tests at work and now has a large corporate client-base, whereby Harj single-handedly carries out eye tests within the work environment. The benefit of this is the cost saving and continuity of service that Harj is able to provide. Harj is a professional, knowledgeable and trustworthy member of The College of Optometrists, and is fully qualified and registered with the General Optical Council (GOC). He has two young children, Sienna aged 3 and Kian 1, and is married to Sushma – a qualified solicitor, who helps out with the administration of the business. Working alongside Harj and Sushma on a part-time basis is Optical Dispenser Les Chappell. Les has over 40 years experience working in the optics profession and has been Practice Manager of a large opticians practice. Les become self-employed in 2006 and now works for independent Opticians within the Yorkshire area. Outside of work, Les enjoys spending time with his family and their two dogs.